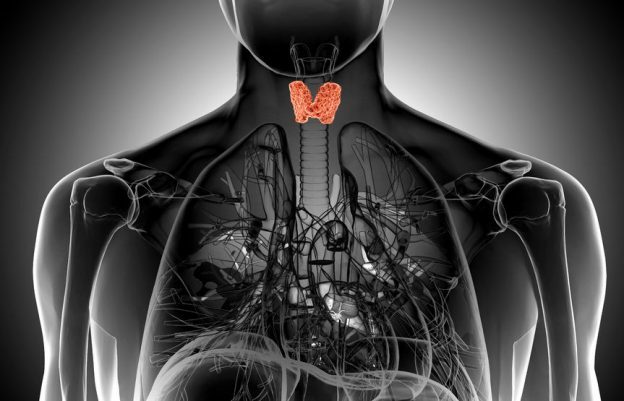 Vitalia Health Care > Blog > diagnose > January is Thyroid Awareness Month! The Vancouver Thyroid Centre (a division of Vitalia Healthcare) is proud to support Thyroid Awareness month as recognized by the American Association of Clinical Endocrinologists and the blue paisley ribbon campaign. The unique paisley pattern of the ribbon is used due to its similarities with what thyroid tissue actually looks like under the microscope. It is estimated that between 5-10% of the North American the population has some degree of thyroid dysfunction or disease and up to half of these cases are undiagnosed today. Symptoms of hypothyroidism can be vague – low energy and fatigue, depression, weight gain and difficulties losing weight, constipation, feeling cold all the time, low libido, hair loss, dry skin and hair, foggy brain, joint pain, hives, irregular periods, swelling, slow reflexes and more. There are varying degrees of symptoms too, some people may notice that under higher stress, the symptoms seem to get worse. Regular screening and physical examination of the thyroid gland should be a part of everyone’s healthcare. To do a quick at home thyroid assessment, grab a glass of water and stand in front of the mirror. The thyroid is located on the neck, just below the Adam’s apple and sometimes can be visualized if there is thyroid dysfunction. Take a sip of water and watch the thyroid area as you swallow. Notice if a bump appears during this process or if any uncomfortable symptoms such as difficulties swallowing or constriction occur. If so, have your naturopathic or medical doctor take a look and determine if blood testing is required.